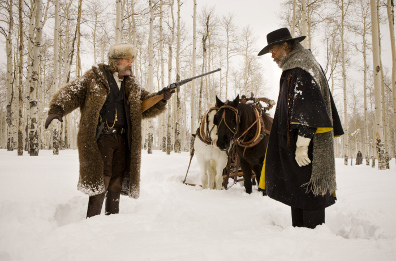 ‘The Hangman’ John Ruth (Kurt Russell, left) is suspicious of ‘The Bounty Hunter’ Marquis Warren (Samuel L. Jackson, right). Some movies come with a colorful history, meaning that their road to the big screen has been rather unusual. One of those is Quentin Tarantino‘s The Hateful Eight. Originally designed as a follow-up to the successful Django Unchained, the director temporarily scrapped the whole project because a first draft of the screenplay had been leaked on the internet and, as a consequence, planned to turn it into a novel. Eventually, however, Tarantino revisited the movie idea after a live reading of the script and assembled a mighty fine cast for it. Now that The Hateful Eight has seen its theatrical run and already made it through the recent awards season, how does it fare in comparison with the remaining works of the cult director?